As we told you a while back, world music inspired jam favorites Beats Antique will be passing through Nashville on Oct. 25 to put it down at Marathon Music Works. Look for brass performers Too Many Zooz and EDM producer Thriftworks to kick the party off right. The music will start at 8 p.m. (doors at 7) and tickets to the 18+ show are still available for here. If you’re still on the fence about going, or if money is tight right now, click on after the jump, and enter our contest, which guarantees you a chance to win a pair of tickets. While you’re entering, take a few minutes to read more about the performers, and we bet you’ll end up buying tickets if you’re not the lucky winner. 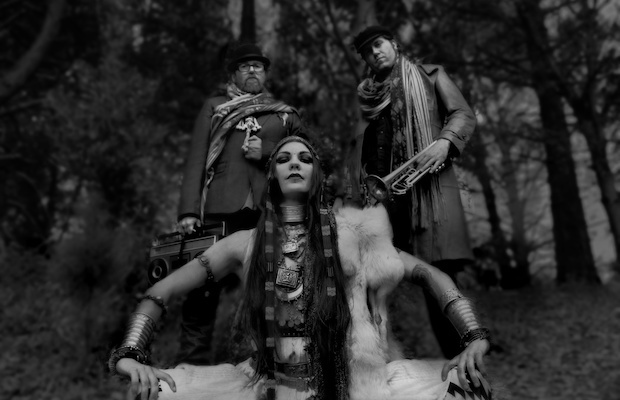 In a world SATURATED with music that is just one band trying to sound just like another, it’s always refreshing to know there are still people out there making truly one-of-kind music that could probably never be duplicated; enter Beats Antique. The trio got their start in Oakland, CA, around 2007, and ever since they’ve been combining elements of old and new world music to create something 100% unique. They infuse Middle Eastern belly dance music with hip hop, and old school jazz with afro-beat. Permeating throughout is electronic music. As they incorporate many different instruments to reproduce their sound at the live show, the group often slip into prolonged jams, with belly dancers and performance artists bounding around stage. Now eleven albums in– including their latest, Shadowbox, which dropped earlier this week– they are still going strong, and showing everyone that it’s ok to be eclectic, and it’s always a good idea to cultivate your own sound. Be there in person for one of the most interesting live shows you’ll ever see, when the Beats Antique touring bazaar stops in on Music City. Winner will be announced Friday, Oct. 21 at 5 p.m. CDT and will receive one pair of tickets. Good luck! Win Tix to Beats Antique at Marathon Music Works! Beats Antique, Too Many Zooz, and Thriftworks will perform Tuesday, Oct. 25 at Marathon Music Works. The show is 18+, begins at 8 p.m. (doors at 7 p.m.), and tickets are available for $22-$25.